SCW builds on Wisconsin’s healthcare data infrastructure to provide Wisconsin facilities and surgeons with benchmarked reports of member-defined performance measures. Using data from the Wisconsin Hospital Association (WHA) and Wisconsin Healthcare Information Organization (WHIO), our biostatisticians and programmers create confidential benchmarked reports for individual hospitals and surgeons. These data sources capture operations performed in inpatient, outpatient, and surgical center settings. SCW uses these data sources, established quality metric algorithms, and the latest evidence on risk and reliability adjustment, to assess improvements in surgical quality over time. There is no need for additional data collection by hospitals or surgeons. By building on existing state data infrastructure, SCW avoids the costly burden of primary medical record abstraction that disproportionately impacts and/or excludes small, rural hospitals. Pursuant to state statute, all Wisconsin hospital and surgery centers are required to submit inpatient and outpatient data to WHA quarterly. A partnership with the Agency for Healthcare Research and Quality (AHRQ)’s Healthcare Utilization Project (HCUP) yielded a validated algorithm for identifying unique patients across facilities in 2013. 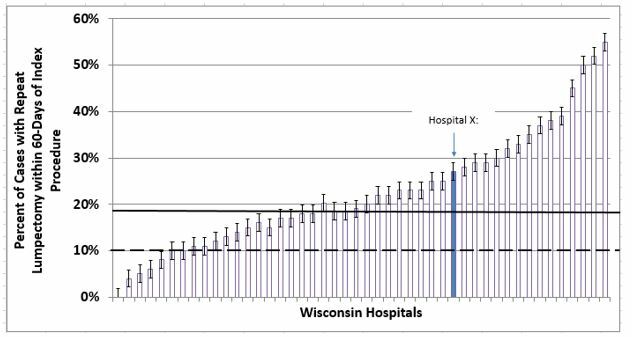 This allows for an unbiased longitudinal assessment of patient healthcare utilization across Wisconsin facilities that does not require manual data entry. WHIO data currently includes private/ commercial, Medicaid fee-for-service (FFS), Medicaid HMO, and Medicare Advantage claims information, covering 84% of the state population. WHIO was selected in 2015 by the Robert Wood Johnson Foundation and the Network for Regional Healthcare Improvement to develop infrastructure to support public reporting on the state, regional, and national level to facilitate quality improvement. If your facility has signed a Hospital/Facility Participant Agreement, you are eligible to receive a confidential performance report. Please contact Jeanette May, Administrative Director, for more information. If your facility has not yet signed an agreement, you can read more here about how to join the collaborative.